If you have a dog dasher or one who is particularly anxious during parties or when friends come over. Keep them in a quiet room in your house with the door closed. 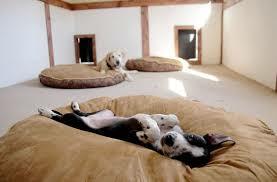 A soft bed with some water, treats and toys in quiet area and keep him content while your guests are over. Also, make sure to talk to your guests about how to best interact with your dog or puppy when they arrive. Tell your guests that your pet is shy or afraid and not to try to pet your furry friend until you introduce them. If you have an indoor cat tell them not to leave doors open if they step outside or onto your deck or porch. There’s nothing wrong will gently advising your guests of your pet safety plan. You may introduce your dog when guests arrive then take him to his quiet room before you sit down to dinner or get on with the party festivities. If your dog is a dasher, I would advise you to keep your furry friend in his quiet room before your guests arrive. I would also introduce your dog to his quiet room a few days before your party or dinner. Let him explore his bed, toys and other things that will occupy him while you are entertaining. Good look and keep your pets safe during this holiday season. This entry was posted on Wednesday, November 21st, 2018 at 10:45 am	and is filed under Pet Supplies. You can follow any responses to this entry through the RSS 2.0 feed. Both comments and pings are currently closed.